There is an unfortunate myth circulating within the healthcare space—an urban legend we would like to put to rest. Here it is. Consumers don’t trust the healthcare system. This myth suggests that brands emerging from outside healthcare will be the ones to save it. Take a quick look in the app store, and you’ll find a million consumer-driven apps that have little to no connection with the healthcare system. One data point used to perpetuate this tall tale: If consumers trust healthcare organizations so much, why is there so much consumer demand and engagement with solutions that aren’t provided by the industry? This much is true. Consumers are tired of having to juggle multiple information sources to get the help they need. They are overwhelmed and confused by Dr. Google. They are asking for a single, consolidated version of the truth. And they are simply not getting what they need from healthcare today. In fact, our most recent consumer research uncovered massive frustration with the current healthcare system. But don’t mistake frustration for lack of trust. Our research also identified an underlying belief in the system. 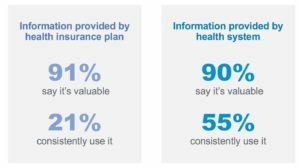 As an example, 91 percent rated the information provided by their health insurance plan as valuable, with 90 percent saying the same of the information provided by their health system. But only 21 percent of consumers consistently used the information provided by their health plan, while around 55 percent reported using information offered by their health system. So, there is a big gap between perceived value and consistent use. The challenge is not that consumers don’t trust the system. It’s that they can’t effectively navigate it. Create a seamless experience, including tools that are connected and easily accessed by the patient, caregiver, and care team. We don’t need a plethora of specialized consumer technology brands in healthcare. We need clearer pathways and smarter connections to help individuals engage with the brands they already trust. And trust is the operative word here. A new survey of 4,000 diverse participants by Rock Health shows that only 11 percent of Americans trust sharing their personal health data with some of the biggest players in consumer technology. If trust has to be earned for Apple and Amazon, imagine what the reality must be for lesser known organizations that are filling up the app store. These brands may be able to tout that “thousands” or even “millions” have downloaded their apps, but where is the real value in that for the healthcare system if trust doesn’t come with it? So, who did Americans trust based on Rock Health’s results? When it’s their personal information—which is mission critical in healthcare— they have faith in health plans and providers. That should come as no surprise. People trust the organizations that are specifically tasked with improving their health and delivering their care. Again, our rallying cry in the industry should be this: How can we create more intelligent connections between consumers and those entities who are responsible for improving health and delivering care? We once bought into the trust myth here at Wildflower Health. When we first started the company nearly seven years ago, we had the hubris to think we should put out apps with our own brand, as we assumed consumers would like that better. However, what we’ve found is that the more our products are white-labeled under the brands of our health plan and health system clients, the more likely users are to engage and use the technology. We’ve worked with many payers and providers who realize their brands have power. They understand there is a far bigger opportunity than “moment in time” engagement and that the real end game is to digitize and mobilize their entire enterprise so they can follow and serve their members or patients as needs evolve. This approach leads to sustained engagement, member satisfaction, patient loyalty, and better outcomes both clinically and financially. And trust us, this is the approach that will dispel the aforementioned myth once and for all while curing much of what ails healthcare today.